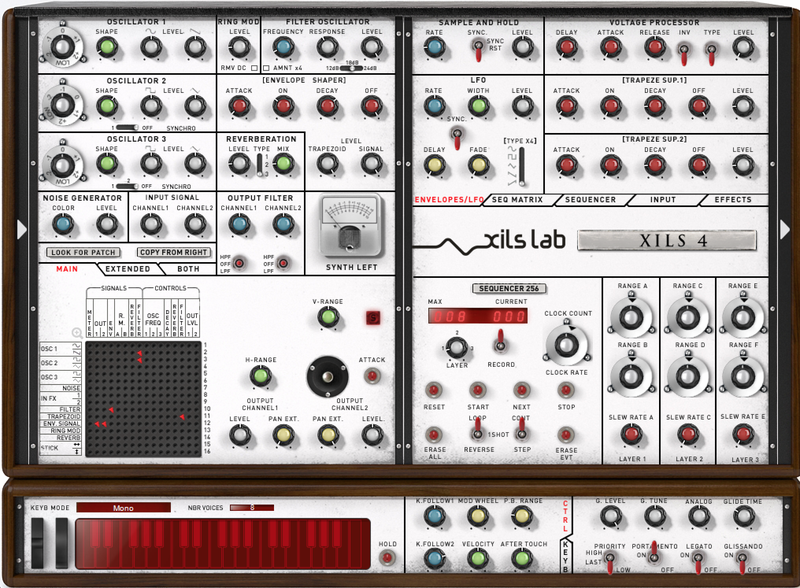 XILS Lab is at it again with a new emulation of the VCS4. The company has been making strides in emulation with great versions of other classic gear as well as some new plugins such as RAMSES, their rhythm based gating and envelope effects plugin. EMS (Electronic Music Studios), a British company founded by the pioneering Peter Zinovieff, made musical history in 1969 with its introduction of the VCS3, the first portable synthesizer commercially available anywhere in the world. Its innovative modular matrix-based patchboard dispensed with the telephone exchange-like cabling of other (much larger) modular systems in favour of making connections with (removable) coloured pins, so it could be comfortably housed in a small wooden (solid afrormosia) cabinet. Not so well documented, though, is the stuff of legend: the 1969-vintage VCS4 was EMS designer David Cockerell’s so-called ‘Live Performance Module’, comprising two VCS3s sat side by side, together with a five-octave keyboard, a mixer, and a signal-processing unit, all housed in a single wooden cabinet. Only one prototype was ever produced, its ear-opening sounds lost in the sands of time… until now, that is! 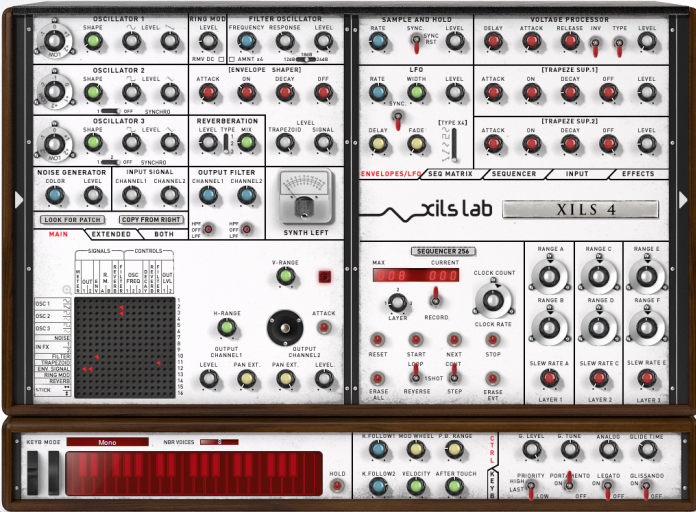 By being based on two intricate and interacting VCS3 (‘Synthi’) cores — following in the fanciful footsteps of its one-off analogue ancestor to a tee, XILS-lab’s XILS 4 favourably emulates EMS’ VCS4. Indeed, those two cores can be set to work side by side or operate in serial (with one feeding the other). Each and every module on one side can be used to modulate or feed anything on the other side with stunning sound possibilities plus weird and wonderful effects readily available in abundance as a direct result. That said, XILS 4 shows its true 21st Century colours by also allowing amount settings to be individually applied to each patch ‘pin’. Providing patchboard power par excellence to an already special soft synth shows that there is clearly so much more to XILS 4 than solely emulating vintage hardware — rare as the vintage hardware in question clearly is. Little wonder, then, that XILS 4 is billed by its creator as being the Ultimate Analog Matrix Modular Synthesizer! XILS-lab has sought to take things severals steps further still by coupling those cores with the SEQUENCER 256 module, inspired by EMS’ trailblazing Synthi Sequencer 256 namesake. Needless to say, this three-layer sequencer with analogue-to-digital and digital-to-analogue converters to enable digital processing of control voltages to drive multiple analogue synthesizers or multiple parameters with storage of up to 256 ‘events’ was well ahead of its time when released in 1971. Here in the virtual world, XILS-lab has well and truly transported it to the present day with three independent layers, slew rates, and recording modes, together with added abilities like sequencer layers acting as modulation sources in a dedicated SEQ MATRIX — matchless, even by today’s most sophisticated DAW standards! So is that all? No, not at all! Adding a second ‘pin matrix’, two additional envelopes, an LFO, comprehensive SAMPLE AND HOLD module, and VOLTAGE PROCESSOR, plus several new input modules — including GATE, ENVELOPE FOLLOWER, and PITCH TRACKER — means that there are hundreds of additional connections available to the discerning synthesist set on exploring XILS 4 to the full as a superlative soft synth or as a powerful effects processor plug-in in its own right. The fact that there are over 1,140 possible connections per patch makes for a literal lifetime of programming possibilities that will surely far outlast the host computer concerned, though those in need of a helping hand have easy access to almost 700 professionally-programmed presets from world-renowned sound designers, including the complete XILS 3 factory library and over 350 presets specifically designed for XILS 4. A selection of tutorial-style patches are also available to help users seeking to take their first tentative steps towards scaling the heady heights of this mountainous modular monster of a soft synth! Simply put, with a whole host of modules and associated far-reaching functionality — for starters, 12 aliasing-free oscillators, grouped in six pairs with wave-shaping and hard sync — yesteryear’s impossibilities have become today’s possibilities with XILS 4… a great step forward, indeed! A giant leap for modular synthesis software, some might say.